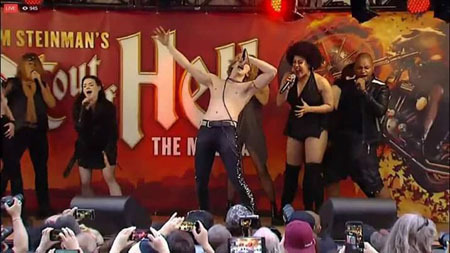 Singer and actor Meat Loaf was in Toronto yesterday to meet the cast of the brand new Bat Out of Hell - The Musical for the first time and join them briefly onstage for a four-song mini-set on a gorgeous spring evening in Toronto. 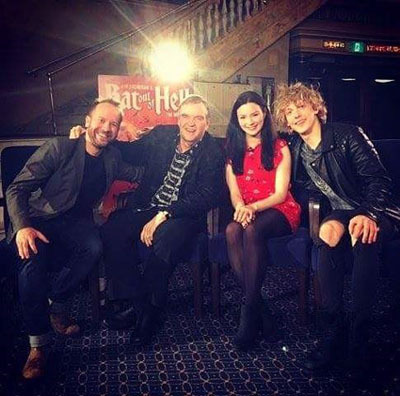 The show, starring Andrew Polec as Strat and his love interest Christina Bennington as Raven, had its world premiere at the Opera House in Manchester, England, earlier this year and opens in London’s West End at the Coliseum June 5. The North American premiere will be in Toronto, starting Oct. 14. Check for tickets here. Directed by Jay Scheib, the musical is based on Meat Loaf’s massive-selling (43 million copies globally, 14 million in the U.S.) 1977 rock blockbuster of the same name, and was originally conceived by its songwriter Jim Steinman for the stage in 1975. In fact, it was performed once, under the name Neverland, in 1977. Forty years and many script revisions later, and Bat Out of Hell - The Musical is now about some rebellious teens in post-apocalyptic Obsidian, ruled by the tyrannical Falco. Strat falls in love with the leader's daughter, Raven, and sets out to rescue her. To launch the forthcoming show, some four-dozen members of Toronto HOG (Harley Owners Group) chapter 9743 revved up their shiny two-wheel beauties on Yonge Street and slowly rode up the middle of one main block to the mobile truck stage parked outside Ed Mirvish Theatre, where the musical will run. Thousands of fans lined both sides of the street, which had been closed by the city for the spectacle. David Mirvish, founder of Mirvish Productions, spoke first, as Meat Loaf stood side stage by the soundboard. He said he saw the show in Manchester and described it as “a big bright, over-the-top rock ‘n’ roll extravaganza. There’s fire and fireworks. There’s a powerful cocktail of theatrical wizardry, featuring awe-inspiring special effects, and it’s all tinged with nostalgia because of its iconic songs." Legendary Canadian-born producer Michael Cohl (Rolling Stones, U2, Spider-Man: Turn Off The Dark, The Lord of the Rings) then had his turn at the mic, musing about three things -- the French election results “stem[ming] the tide of the insanity of the Americans and the British elections, and to maybe stop the stupidity that’s going on in the world;” the opening of the Pink Floyd exhibition at the “old stodgy Victorian Albert Museum” in London; and the closing of this portion of Yonge Street (Toronto’s Times Square equivalent) by Mayor John Tory for Bat Out of Hell - The Musical. “It took forever for this thing to happen, because few of you would really know that Jim wrote this as a piece in college... and about six years ago [producer] David Sonenberg and Jim came to me and said, ‘Could I help and try to get it onstage?’ The truth is, I’m kind of a champion of hopeless causes, so I took it on. Meat Loaf, who in an interview with Billboard earlier in the day said he plans to see the show for the first time in Toronto, told the crowd, “It is like nothing -- I am telling you -- it is like nothing you have ever, ever, ever seen before... And when you leave the theatre, your mouth will be hanging open and you will be at the box office getting another ticket because you can not see this musical in one night." With that, nine of the cast members crammed the stage, with musical director Robert Emery doing his thing at the side. Meat Loaf joined in on some lines for the first number, “Dead Ringer For Love,” before leaving them to continue with “For Crying Out Loud,” which ends with Strat and Raven kissing. Dom Hartley-Harris (as Jagwire) and Danielle Steers (as Zahara) then took the lead, dueting on “Two Out of Three Ain’t Bad,” and then it was the full pandemonium for the closing title track. 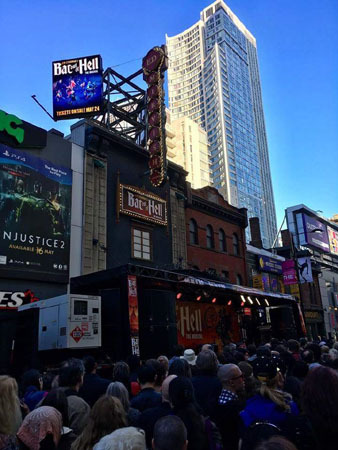 Bat Out of Hell - The Musical marks the first production from a new worldwide partnership between Cohl’s Iconic Entertainment Studios and Canada's Bell Media. It is co-produced by Sonenberg, Cohl for Iconic Entertainment Studios, Randy Lennox for Bell Media and Tony Smith.